This one took quite a bit of time, including a few hours after the workshop; partly due to the detail in the boats, and the size. There is a lot of paint mixing for a 12"x12". - Lots and lots of paint is required! Buy the big tubes. - Paint on the palette must be spread out so that you only pick up a bit on the edge of the knife. This means that you need a really big palette. That's going to be tough for plein air unless traveling by car, with a small table to augment the palette area. - It's important to remember to clean the knife after every stroke. You get messy edges and mottled color if you don't. So lots of paint gets thrown out. - It's great to only have a few knives to clean up, which is easy to do with wet wipes. A plus for traveling. Bottom line, it's really fun, and certainly different. I recommend giving it a try. And you won't have more fun than in a class with Leslie. Day 2 of Leslie Saeta's palette knife painting workshop was a great learning experience. We are all getting a better feel for the knife in our hand, and learning to hold it up to the painting and I'm lagging behind. Afterwards, Leslie made dinner for all 14 of us, which was a very special treat! I spent today in the first day of Leslie Saeta's palette knife painting class in Atlanta. It was a great success! Fourteen students, lots of color mixing, and fun learning to paint another way. Leslie is a wonderful teacher. She's patient, organized, and makes sure that everyone "get's it". Kathy Cousart assisted Leslie, and it was great to get to know her better. 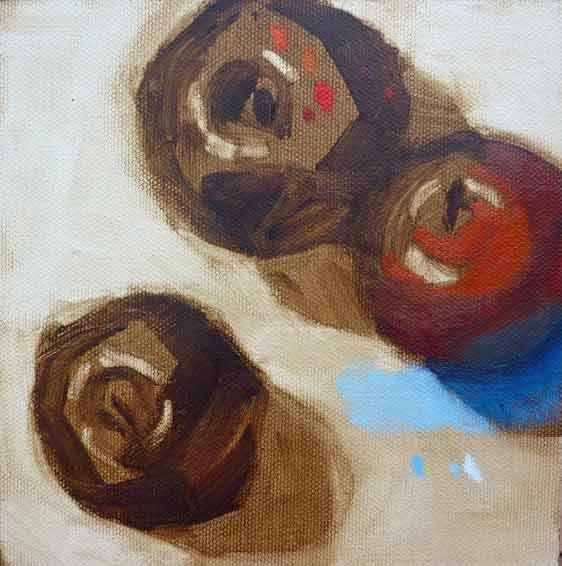 Sometimes a painting resonates with multiple people and I get asked if I have any more like it. This happens most often with local scenes that have memories for lots of people. It also helps if one of your state representatives uses it on their campaign literature! Thanks, Janice Cooper, Maine State Rep for Yarmouth, for that. 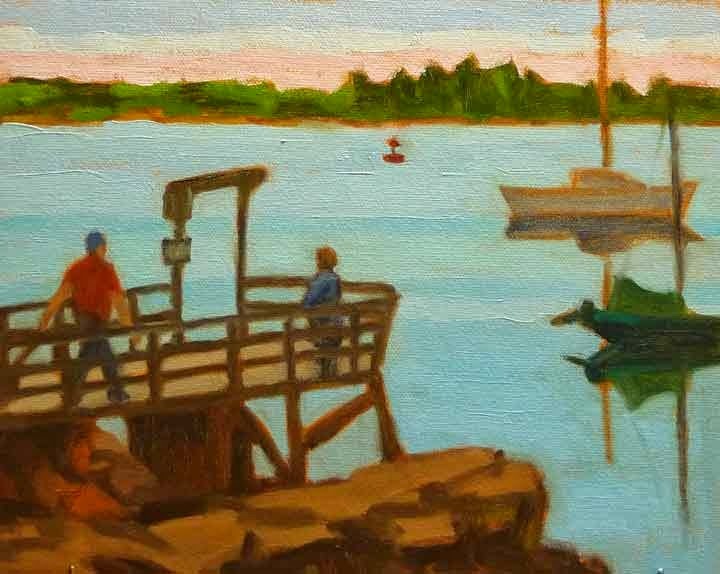 So when Beth from Yarmouth Frame and Gallery emailed asking if I'd done any more painting of the dock at Littlejohn Island, I thought, why not do another? And then, how do I want to make it different? I decided to use different people. 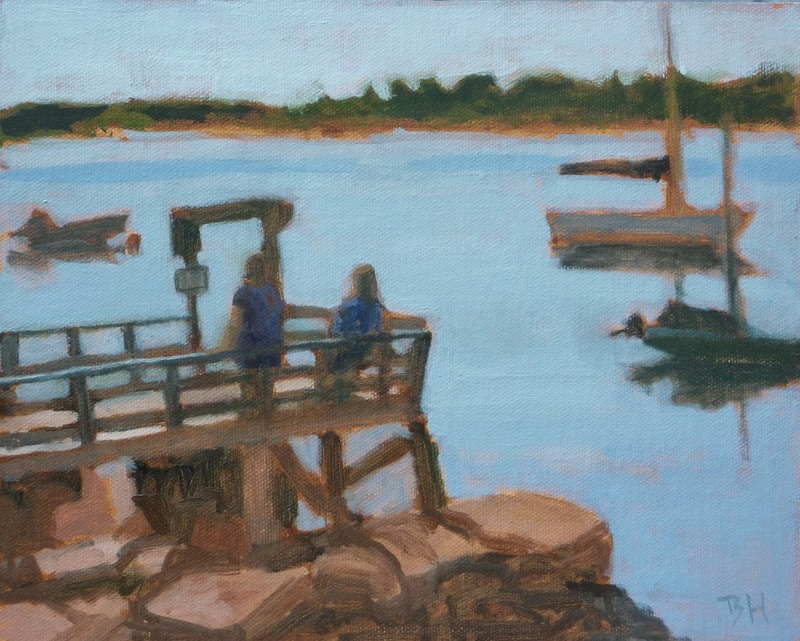 In the original plein air piece a couple of guys had been lounging on the dock for a few minutes, and I'd started with them, but found they became Janice and her daughter, Becky. 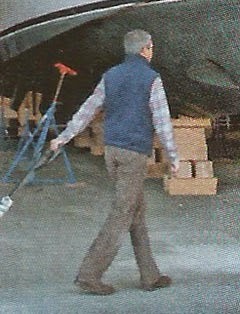 This time I wanted more action, and I looked through boating magazines until I found a guy pulling a wagon. He was dressed in winter clothes, but that didn't matter, all I was looking for was the stride. It's amazing how little you need to make a person look pretty life like. And it makes the painting tell a different story. Saturday's Workshop - Such Fun! We had such fun at my Daily Painting workshop at Artascope in Yarmouth on Saturday! Six great students, some drawing, the 10 minute fruit exercise (my favorite), value painting over a photo (a student favorite), and a finally repainting the value painting in acrylic burnt sienna and white, drying it, and then applying color on top. 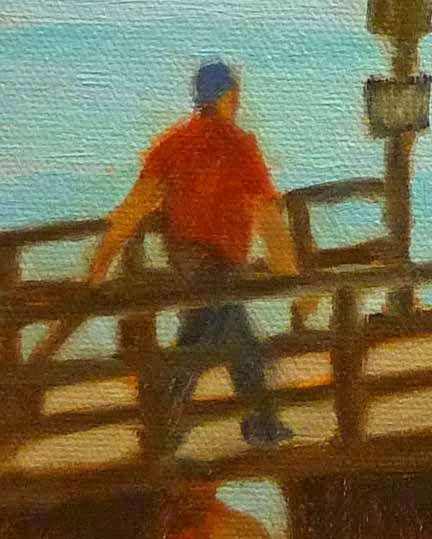 Dotting your mixed color on the brown value painting, then squinting lets you see if you've mixed your color at the correct value. It really works, try squinting at the study below.